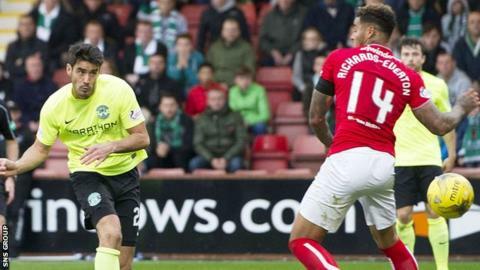 Hibernian came from behind at Dunfermline for their first win in six games and increased their Championship lead to three points. Nate Wedderburn deflected in a James Keatings strike, Grant Holt converted a penalty and Brian Graham added a last-minute shot for the visitors. The Pars led at the interval through Kallum Higginbotham's spot kick. The struggling hosts, with one league win in nine, lost Michael Moffat to a straight red card in stoppage time. Neil Lennon dropped the Championship's top scorer Jason Cummings to the bench and his selection finally came good after the break. The Easter Road side have felt hard done by when it comes to some refereeing decisions lately and their manager's mood wasn't improved when Alan Muir awarded Dunfermline a penalty on 21 minutes. The official indicated it was for a shove on Lee Ashcroft in a packed box following a corner. Higginbotham sent goalkeeper Ofir Marciano the wrong way from the spot kick and a more assured finish by former Hibee El Alagui shortly afterwards would have put them two ahead. The visitors seemed to let their sense of injustice get the better of them for a spell while the home team's high energy pressing limited their chances to level in the first half. The closest they came were with two long range free kicks, Keatings curling the first off the top of the crossbar while Sean Murdoch made a brilliant save from Fraser Fyvie's effort. Hibs levelled nine minutes into the second half when Keatings cut in from the right and his shot took a big deflection off Wedderburn. With the Pars buckling under pressure, Ashcroft gave away a penalty when he pushed over Andrew Shinnie when the Hibs midfielder threatened to get clear. Holt converted the resulting kick, sending Murdoch the wrong way. Substitute Graham rounded off an impressive second-half performance with a third in the dying seconds, firing a shot high into the net. Hibs assistant manager Gary Parker: "At half time we did think it might be another one of those days but we had good chat at half time and we got the bit of luck we needed with the deflected goal. "We deserved that and those deserved the win in the end. The manager had a go at them at half time, rightly so, but they are good lads and they went out there and showed what they are all about. "We just want to keep winning games now and try to climb away at the top.That is our main objective as we keep striving to get promoted." Dunfermline manager Allan Johnston: "It was frustrating because we played really well in the first half but not the second. "We stopped doing what we did well then their first goal takes a massive deflection when its going a mile past and that gives Hibs a big lift. "It's a hard one to take then the sending off at the end is never a sending off. I've seen it again on the video and it's not even a booking normally. It's probably the reaction of the players that he was sent off." Match ends, Dunfermline Athletic 1, Hibernian 3. Second Half ends, Dunfermline Athletic 1, Hibernian 3. Michael Moffat (Dunfermline Athletic) is shown the red card for violent conduct. Goal! Dunfermline Athletic 1, Hibernian 3. Brian Graham (Hibernian) right footed shot from the centre of the box to the top left corner. Assisted by Andrew Shinnie. Attempt blocked. Andrew Shinnie (Hibernian) right footed shot from the right side of the six yard box is blocked. Corner, Hibernian. Conceded by Nathaniel Wedderburn. Substitution, Dunfermline Athletic. Paul McMullan replaces Michael Paton. Corner, Hibernian. Conceded by Sean Murdoch. Attempt missed. Grant Holt (Hibernian) header from the centre of the box is close, but misses the top left corner. Corner, Hibernian. Conceded by Ben Richards-Everton. Attempt missed. David Hopkirk (Dunfermline Athletic) right footed shot from outside the box is just a bit too high. Substitution, Dunfermline Athletic. Michael Moffat replaces Kallum Higginbotham. Substitution, Dunfermline Athletic. David Hopkirk replaces Farid El Alagui. Goal! Dunfermline Athletic 1, Hibernian 2. Grant Holt (Hibernian) converts the penalty with a right footed shot to the bottom right corner. Penalty Hibernian. Andrew Shinnie draws a foul in the penalty area. Penalty conceded by Lee Ashcroft (Dunfermline Athletic) after a foul in the penalty area. Grant Holt (Hibernian) wins a free kick on the right wing. Attempt missed. Darren McGregor (Hibernian) right footed shot from the right side of the six yard box is too high. Corner, Hibernian. Conceded by Lewis Martin. Corner, Hibernian. Conceded by Jason Talbot.